Karlheinz Stockahausen is dead at 79. I admit to never being able to entirely relate to his music. I first heard him while in college, buying the recording of "Mikrophonie I & II" on Columbia that was released in 1966. I probably got it in '73 or '74. I remember being very fascinated with "I", not so much with "II". Much to my embarrassment, I traded it in later in the decade in a ongoing fit of pique at European elitism (! ); traded in a bunch of stuff like that, idiot that I was. I saw "Mikrophonie I" performed at a Bang On A Can affair some ten or twelve years back. Seeing it played, it lost some of the mystery that was in my memory, from back when I didn't know from contact mics or how all those sounds arose. 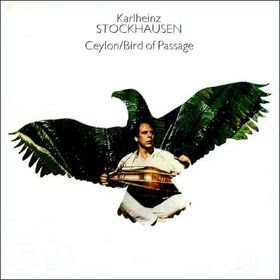 Soon thereafter (around '75), I bought "Ceylon; Bird of Passage" which I guess was getting a reasonable publicity push as a quasi rock/jazz album out on Chrysalis. Still have that one, for some reason. Should give it a spin this evening. Heard various things over the years, some on compilation albums, but little really moved me. 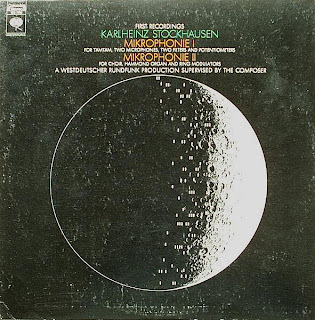 A few years ago, I borrowed a passel of Stockhausen discs from Jon and,with an exception or two, remained not terribly intrigued, perhaps my loss or lack of ears. Just something about the music usually rubbed me wrong. Still, without Stockhausen, Cardew as such wouldn't have existed, hence AMM would've been different. So a grateful tip of the brim is certainly in order. And, of course, that guy in the picture below learned a thing or two from him.